'We do move at a hell of a pace most of the time, which is really exciting,' says Hamilton. Picture: John Devlin. According to an oft-cited quote attributed to James Bach, a guru of software-testing, the hi-tech endeavour is “an infinite process of comparing the invisible to the ambiguous in order to avoid the unthinkable happening to the anonymous”. While the activity provides a robust and much-needed scrutiny of the processes that form the fabric of our increasingly digital world, it has also served as the vocation of Sharon Hamilton, who leads Bellshill-based Edge Testing in the managing director role. The software-testing specialist was founded in 2007 and says it is now the UK’s largest independent software testing company, with more than 260 people and a client base including Google, Royal Bank of Scotland (RBS), Aberdeen Standard Investments, Heineken and Gatwick Airport. It typically becomes involved with an organisation when the latter is implementing a new system or significantly overhauling an existing one, and tests back-office systems, e-commerce sites and apps, accessing them from multiple devices such as desktops, laptops, tablets, touchscreens and smartphones from its purpose-built device lab. Hamilton’s career in the field came about almost by chance when she was working in finance at US-based IT giant Unisys, having been offered a job after undertaking a placement there during her business studies degree, after doing maths, economics and computing at A level. Mulling the decision to take up the offer of moving into software-testing, (“At that point I didn’t really know what it meant, I didn’t know anyone else in that space, and I hadn’t really gone into IT”) she eventually made the leap that proved pivotal both in her career and life more broadly. “It was absolutely fantastic,” she states of her new path, and after a couple of years at Unisys she went to work in the City, for retail banks such as NatWest, prior to its acquisition by RBS in 2000. Hamilton then moved into investment banking, progressing through the ranks, and a relocation to Scotland saw her join Edinburgh IT consultancy Newell & Budge, now part of Sopra after being taken over in 2005, and she met Brian Ferrie and Susan Chadwick, who would establish Edge. Hamilton joined the latter in 2011, when the team was very small, as a service delivery manager, and before being appointed MD was responsible for all operations and sales across the UK. She officially took on her current role last year with the acquisition of Edge by Eurofins Digital Testing, which is billed as the world’s top testing and quality assurance specialist, and has a presence in the like of the US, Belgium, Poland, Sweden and Hong Kong. And Hamilton says the change of ownership has really opened up new avenues for the Scottish company as it pursues expansion at a rate of knots. 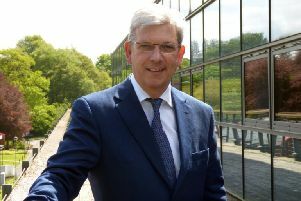 The firm has unveiled a flurry of announcements over the past 18 months, such as major appointments to “really spearhead” growth in England with on-the-ground local resource, for example signing up David Singleton as regional manager for England and Wales in a new role created as part of Edge’s nationwide expansion strategy. After opening up in 2012 in Birmingham, and London at the start of 2014, the business earlier this month opened its latest UK base in Manchester city centre. At the time of the announcement, Hamilton praised the city and wider region’s robust technology focus and reputation, and deep talent pool, with Edge seeking to create 60 jobs in the area in the next two years. “The north [of England] is a highly valued area for us, and our aim is to increase our existing client base across the region,” the MD said. The Manchester base will also house Edge’s third Digital Test Hub (DTH) after Bellshill – which launched six years ago as what the firm said was the first of its kind in the UK – and Birmingham. The offering was set up to meet requirements for low-cost, on-demand testing services, and vie with offshore providers. The DTHs have in fact contributed to Edge adding 17 clients (the majority of which were in England) since the appointment of Hamilton as MD. Other new strings to its bow include being able to give clients in Scotland and the UK more broadly access to a new security division – Eurofins Cyber Security – which boasts about 100 security experts worldwide and provides services such as risk and vulnerability assessments. “You only need to look at any newspaper of the day to see someone is struggling with a security aspect of their systems – and it’s really hurting businesses,” says Hamilton. Indeed, organisations to have hit the headlines in the last year for data breaches include British Airways, Dixons Carphone, and several councils. Additionally, UK Finance said recently that £1.2 billion was stolen by criminals committing fraud – authorised and unauthorised – last year. The public sector has proved a highly fruitful source of business for Edge, and clients in this space include the Student Loans Company, the Scottish Prison Service and the Big Lottery Fund. And Edge said about ten days ago that it had been appointed to the Scottish Government’s digital services procurement system, which was set up to encourage competition and simplify access to digital expertise and services across public sector organisations. “For over a decade now, Edge Testing has played a pivotal role in helping Scottish public sector organisations to reduce costs, whilst managing risk, implementing process efficiencies and positively improving service quality,” Hamilton said when the announcement was made. Other moves unveiled by the company include the establishment in 2013 of its Edge Academy software testing education programme, which the MD calls a “really exciting part of the business” and fuses hands-on experience with classroom-based training. It comes amid a sector-wide shortage of suitable digital skills, and academy graduates now exceed 130, with the initiative having attracted a diverse mix, from school-leavers to say, former police officers. It is also adapting to the need for more technical testers. The company also at the start of 2019 launched its Academy as a Service offering, letting a client decide on the number of testers required, who are trained at the Edge Academy. Edge says the organisation in question benefits from a “low risk, cost-effective alternative to relying on contractors” and the individuals taking part a fast-track opportunity for qualification and employment. The economic backdrop is dominated by the ever-present spectre of Brexit, and she believes the biggest impact will be on customers, “and therefore on the amount they spend with their suppliers… It may limit our ability to work with our Eurofins digital testing partners and we do believe as a management team that [Brexit] uncertainty is really starting to hurt everybody”. That said, “I’d like to achieve the financial targets that are set to us by Eurofins… which we’re on track to do,” and she would like to keep growing and developing the workforce. Highlighting that Edge has “excellent” representation of women at management level, for example, she expects to see overall headcount grow by about 20 full-time roles in Scotland and up to about 30 in England, mainly in Manchester. The aim in Scotland is for continued growth, but this is likely to be outstripped by the effervescent opportunities presented south of the Border. Her current role has provided a welcome return to finance, but Hamilton that she remains a “tester at heart”. Such a calling means “you never lose that level of inquisitiveness about understanding why things are doing what they’re doing”.